Maple syrup is brewed from the sap of the sugar maple tree on farms in all the New England states each March, then appears on breakfast tables to top pancakes or waffles the rest of the year. Sugar syrup from tree sap? Yeah, it sounds highly unlikely, but I assure you it's true. From February to April, farmers in New England drive more than 13 million little pipes called taps into their sugar maple trees' trunks, and hang buckets underneath the taps or attach tubing to them to catch the sap, some of which drips out of the taps as it rises within the tree trunk. A sugar maple (Acer saccharum) must be at least 40 years old, or about 10 inches (25.4 cm) in diameter to produce useful quantities of sap. The buckets are collected and brought to the sugar house, a small building containing a cauldron in which the sap is simmered for hours, driving off most of its moisture and reducing it to pure syrup. 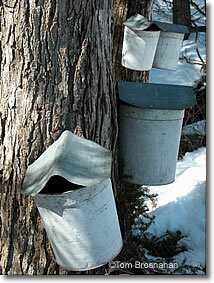 It takes between 40 and 43 gallons (151 to 163 liters) of sap to produce one gallon (3.79 liters) of maple syrup. The maple sugaring season is in late winter and early spring when the days are warm but nights chill—perfect conditions for the rising of the sap. 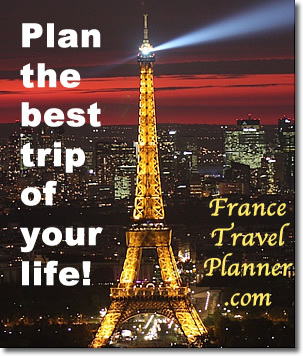 It usually lasts four to six weeks. If the winter has been a mild one, the sap may start to run as early as February in southern New England, and may last well into April in northern New England, so the surest time to see sugaring in progress anywhere is March. Later in the season the sap carries less sugar, and syrup produced from it is darker, with a stronger, somewhat coarser flavor. Vermont, the USA's largest maple syrup-producing state, makes nearly 2 million gallons (7.6 million liters) of syrup each year, about 40% of all the maple syrup produced in the USA (4.3 million gallons). New York is next, and after that Maine. Michigan, New Hampshire, Pennsylvania, and several Canadian provinces (especially Québec) are also substantial producers of maple syrup. All in all, US maple syrup is a $500 million industry. Traditional state grading systems with terms such as Grade A Light Amber, Medium Amber, Dark Amber and Grade B, have been replaced by an international standard created by the International Maple Syrup Institute. Golden is produced from the earliest sap drippings. It has a lighter color and flavor. Dark has a deeper, more intense color and flavor. Amber is in between. Golden and Amber are the preferred grades for table use. Very Dark, produced from sap near the end of sugaring season, is darker than Dark, a bit coarse in flavor, and therefore better for cooking than using at the table. Labels must include information on the producer and its location. Maple syrup can be used as a sweetener with any food, but it's best on breakfast pancakes, waffles, french toast or sausages. Do you like baklava, the sweet flaky-pastry dessert of the eastern Mediterranean? It's traditionally made with honey and/or sugar syrup, but in Vermont you'll find it made with...maple syrup! dripping from taps driven into trees. 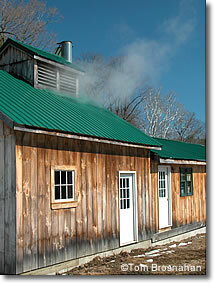 A maple sugar house near Brattleboro, Vermont. Note the steam coming from the roof vent.